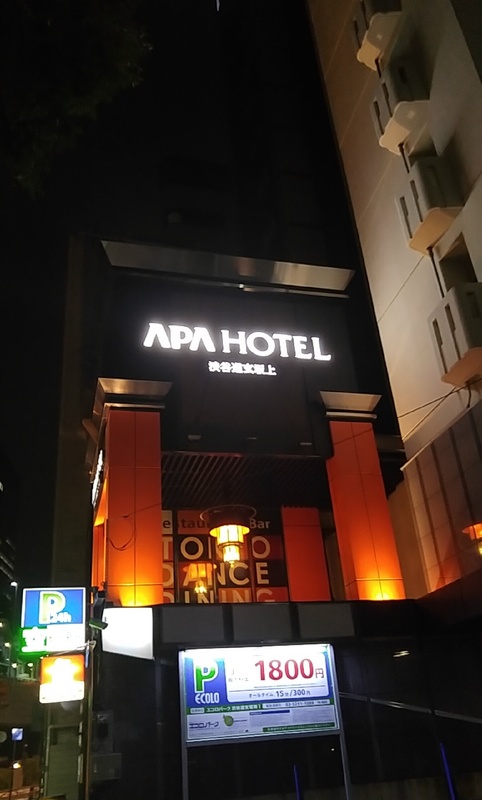 My friend and I booked a room at the APA Hotel in Shibuya, partly because it looked nice but mostly because it was the only thing available when we tried looking for a place to stay while I’d be visiting. (The problem with last minute trips during holidays). We were pretty impressed at first. It was clean, the people working were friendly. 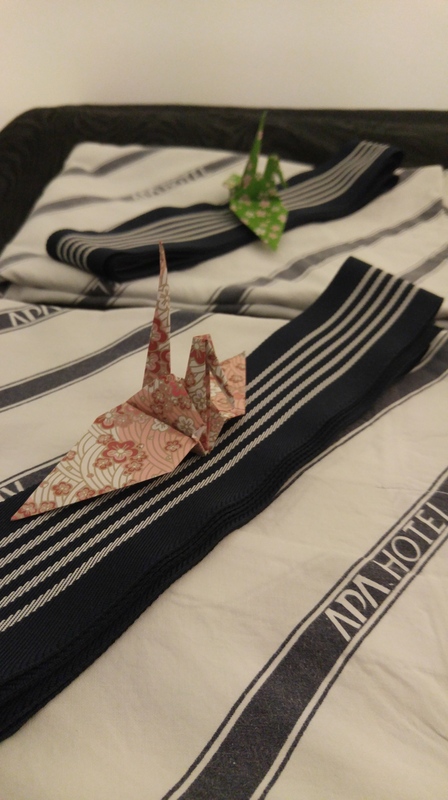 There were origami paper cranes for each of us in our room and robes and shoes. There was an extraordinary amount of ementities (you could have left all of your stuff behind and pretty much been fine). It was small but nice. It reminded me of the Tune Hotel in London. You had to use your key to use the elevator and to turn on any power in your room. After sleeping on a rock hard Korean bed for 4 months this fluffy Japanese hotel bed was like a cloud. I loved it. There was just enough space for my big backpack and all of my friends stuff. (Her scholarship with her housing was up and she wouldn’t be going to her host family until after the holiday so she had all of her stuff with her). The original downfall was that it was somewhat far from the station uphill, which wouldn’t have been that bad if my friend wasn’t lugging everything she owned and it wasn’t hot and humid. Everything was great until my first full day in Tokyo. My friend had work so she left early in the morning and I got up and left around noon since we’d been out late and gotten up early for breakfast and I was just all around exhausted from traveling. When I left I took my key with me and said hello to the cleaning crew in the halls. After a long day of exploring my friend and I didn’t return until about 1am. At 1am, tired and gross from a long day we returned to our hotel room to find the door bolted open and the light on. My friend, armed with her umbrella banged the door open and proceeded into the room carefully but loudly. The light in the bathroom was on as well and that door was opened umbrella first. There was no one in our room. Despite the power being on it was still hot. There was a membership key sitting in the power box. We quickly checked on our luggage, everything was there. The room had been cleaned. The bed had been made, the amenities had been restocked, we’d received new robes and even a random unopened hotel water bottle. My friend called down to the front desk to ask why our room had been left open for possibly 13 hours and see if something could be done. The person she spoke with was very dismissive. He came up, looked around and went on his way, not offering any reasons or compensation. We went to bed, but my friend was pretty shaken up and was up early the next morning to talk to the front desk again. By the time I joined her she was pretty fried. She decided to carry her laptop with her for the rest of the day. While she went up to collect her important things I spoke with the lady at the front desk. She asked if I had put a do not disturb sign on the door when I left and when I said I hadn’t she seemed surprised and confused. She pulled out a clipboard and said if we hadn’t put up a do not disturb sign then house keeping should have gone in, but no where in their records did it say house keeping had entered our room. We could wait until 1pm and move to another room (seeing as it was my last day in Tokyo we had no plans to be back at the hotel or anywhere near it until we went to bed). We could remove all of our luggage downstairs and put it by the front door where it would be under a surveliance camera (apparently there were none on our floor) but there was a wall blocking the staff from being able to keep an eye on it, so any one could run in, grab it, run off and we’d just have proof of who did it. We could call the police. Which was what my friend opted for. One thing I had originally noticed was that there were police everywhere in Tokyo. Every block or two was a little police station. It was pretty reassuring until we actually had to deal with them. Like the first guy, the three police officers who crammed into our hotel room with us were pretty dismissive. Since nothing was stolen there wasn’t really anything they could do. Especially since house keeping was very adamant they didn’t go anywhere near our room and some other random guy said he’d gone past our room at 4 pm and the door was shut. When we got back at the end of the night my friend had been e-mailed that they couldn’t figure it out. The police gave up. An unsolved mystery. If only they’d been able to figure out whose card it was, but apparently they didn’t have that sort of key system. After dealing with the police and deciding to head out I ran back upstairs and found the do not disturb sign (a magnet on the inside of the door) and put it on the outside. Our room was left alone that night and our extra amenities were just placed outside our door. So over all, the APA Hotel in Shibuya, was nice at first. It was pricey, breakfast (though online worded in a way as included was not and about $20) Their staff was unhelpful with situations that veered out of the norm. The refrigerator that was in our room was hooked up to the power key card system so a lot of the cold snacks we bought to try went bad. (though we should have realized that would happen, but why put a fridge in a room if every time you leave it’s going to shut off?) And it didn’t feel safe. Two of the people we dealt with were nice within their staff, but the rest were dismissive and just wanted us to drop it which felt sketchy and they did very little to actually accommodate us. Plus the overall experience shook up my friend pretty badly and put her on edge most of the rest of the trip and even spilled into when she checked into a different hotel after I had gone home. So thanks APA Hotel for being nice to stay in up until it felt unsafe and then taking a turn for sketchy.